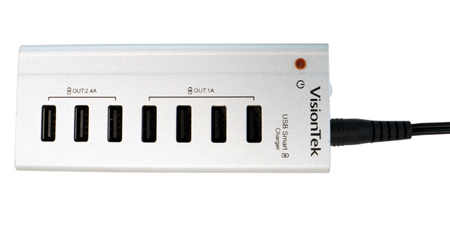 The VisionTek Charging Hub has three ports rated at 2.4A (for iPads, Kindles, pocket power-packs) and four rated at 1.2A for phones and all those other rechargeable gadgets we tend to have around us. 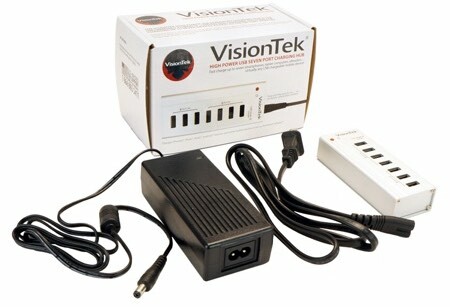 In order to provide all that “oomph” the VisionTek Charging Hub does have to use an external power supply. 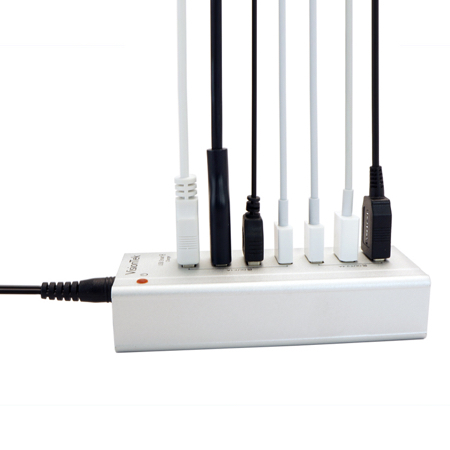 It is a standard auto switching power brick of the sort most laptop users are familiar with. The device is very nicely made in plain but quality feeling aluminium of a good gauge. It takes the DC in on the smallest side next to the pleasantly solid feeling on/off press switch. On the top face are the seven ports neatly grouped in a 3:4 configuration and clearly labelled as 2.4A and 1.2A. The ports are quite close together, but not so close as to make you feel they are jammed together. If you have really big fat sausage fingers then maybe they’d be a little fiddly. But for most people I don’t think they are overly difficult. There is an orange on indicator LED on the top face too. This is suitably diffuse and restrained, something I particularly appreciated as it sits on my nightstand charging a multiplicity of devices overnight. This product has one purpose and it fulfils it excellently. The VisionTek Charging Hub is well made and solidly put together. The silver anodised aluminium construction looks and feels good. I have no doubt the parts I can’t see are of equal quality. The fact it comes with an 18 month manufacturer’s guarantee also reassures me that VisionTek have faith in the quality of their product. I have to say I loved this product. At first I had it on my desk for a day or so – and that was fine, but I soon realised it had a much more obvious home in my life. I put it on my nightstand so could plug in the iPads, iPods, iPhones, Bluetooth earpieces, pocket powerpacks, other mobiles and Android tablets that my family expect to charge at night. I immediately freed up six (count them) power sockets in my bedroom and consigned several ugly wall warts to the drawer. 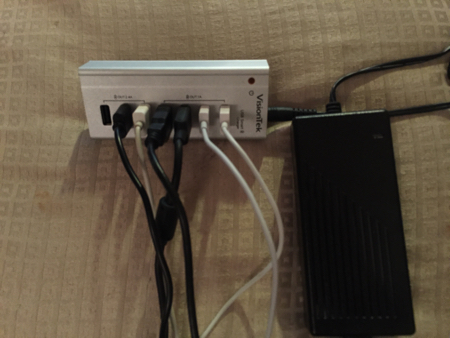 I only have one relatively trivial gripe about the VisionTek Charging Hub. That is when it has a plethora of cables plugged in they can apparently be more weighty than the hub itself and want to pull it off the nightstand or make it move around the desk. I suggested to the manufacturer that perhaps some sort of non slip rubber matting on the bottom would help. They agreed that would not be a bad addition to the device. Additionally I don’t think it would hurt if perhaps it had some “artificial weight” or ballast inside it to help give it a bit more heft. Personally I have simply used some self adhesive velcro pads to attach the hub to the laptop style power supply (which weighs considerably more than the hub), and that works well enough for me. Unfortunately, if you are outside the US it only comes with a US mains plug for the power supply. I know it doesn’t take much to change the plug, or if you are like me rummage in the spares drawer for a “figure eight” mains cable, but it was a very minor let down. This is a brilliant item and to be honest I may find myself buying more of them. Then my family can charge their own damned devices and give me back my nightstand! Or I can gift them to the unenlightened and help them cut down on wall warts too.